Depreciating as soon as you drove it off the lot. The unexpectedness of the phrasing is part of what makes these poems so lively. They overflow with Stallings’ wit, her love of words and wordplay, and her immersion in Greek literature. These inform and transform the everyday from how to clean a cast iron pan (“Cast Irony”), to scissors, to a lost Lego brick, to insects, gardening. The framework with its secret joineries. Or murder itself distilled into a drop. Maybe it’s best to just give up and move. Every morning, check the seem of seams. When darkness blanches and the stars go grey. They are the negatives you cannot prove. The washing machine door broke. We hand washed for a week. Left in the tub to soak the angers began to reek. And sometimes when we spoke you said we shouldn’t speak. The furniture in search of small lost change. There are many treasures in Like, “Sunset, Wings,” “Swallows,” “Parmenion,” and the previously mentioned “Ajar” and “Bedbugs…” among them. Though not every poem is successful, even those that don’t work as well are apt to have a ravishing phrase or two. It’s invigorating to read a poet who can make form new, unique, and alive. 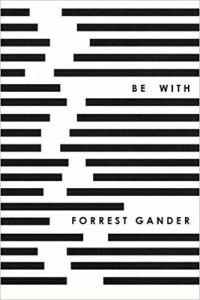 Reading Forrest Gander’s work makes the reader feel as if she’s entering a world larger than her own, one with a broader vocabulary, richer imagery, and a deeper understanding of the relationships between the ordinary and the unknowable. Sometimes one is baffled, but more often feels stretched, welcomed into a cherished complexity. On the cover of his newest book, Be With (92 pages; New Directions), the names of the title and author in severe san serif type are pinned between black lines and the absence of lines. It’s a perfect cover for a book that explores absence and presence, loss and the lingering echoes and shadows of an entwined life. Loss may be of a loved one, of opportunity squandered, of regret for a murderous political history, of an aging and failing parent. 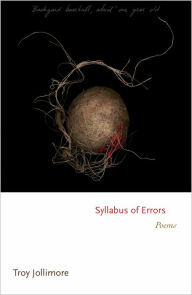 It has as many forms as language can express, and in some poems here, one language doesn’t seem enough, and the poems slip into Spanish. Of course, the book revolves around the loss of Gander’s wife, the poet C.D. Wright, but it does so in ways that delineate the nuances of grief, both particular and universal. 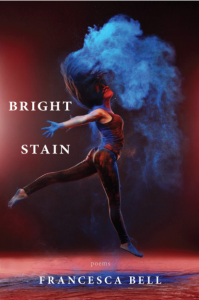 The first and longest section of the book focuses on this theme, followed by a short section of poems and prose poems about the loss of the poet’s mother to dementia. The final section, “Littoral Zone,” is harder to define. There are no pat answers here, but many probing, sensitive explorations. The poet is feeling his way through difficult territory. 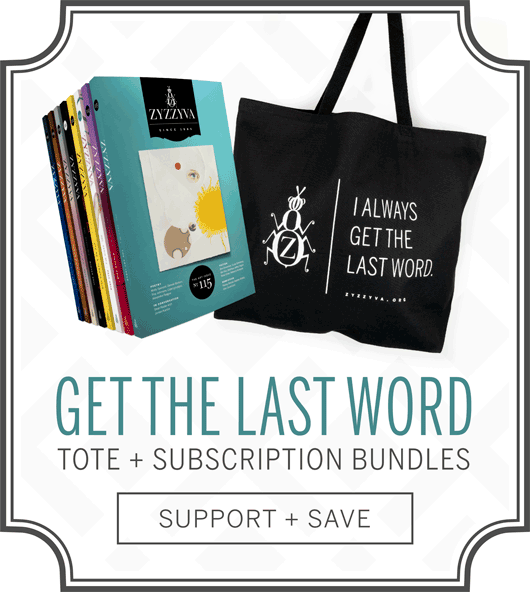 At which point my grief sounds ricocheted outside of language. At which point, coming to, I knew I’d pay the whole flag-pull fare. your fault to break you. some possibility, in which I didn’t believe, some possibility of being with her once more. This journey from unspeakable pain to the shadow of a possibility of solace follows the strange logic of grief over time, and it does so with beauty, strangeness, and absolute control of the language that describes emotion that is out of control. To read Gander’s work is to expand your knowledge of the natural world (helminth parasites, a vulture-bone flute, cockchafer, crocodile scute, lechuguilla). And because of his background in geology, the formations of the natural world appear and are named—trachyte hoodoos, Panther Laccolith, for example. These send us to search out their meaning, pushing the bounds of what we know and see and adding, as in the poem “Evaporación: A Border History,” a solidity to the surreal carnage: “Mexican corpses marooned/under desert sun…Both vaqueros/staked out naked, screaming on an ant hill.” The poem mixes Spanish and English, ending with the keening of the Spanish gerund, aullando, “howling.” It seems fitting, a gesture of solidarity with the “Depositions/of carnage.” Loss is both personal and political, our legacy of a troubled border. The poems that follow, in the “Ruth” section of the book, chronicle the implacable progression of aging. The mostly flat, almost reportorial passages are peppered with startling reflection: “And it won’t/get any better. Absolutely/nothing to look/forward to, she says/to whom/if not you?” Or the recognition of the blood tie, so familiar, so that looking at oneself “in the mirror I see/her face, her small/dark eyes.” The longer prose poem passages are filled with memory—the small, daily humiliations of dependency, love, and disgust— as the poet, awash in his own grief, reaches for acceptance, “akin to what a mother might feel for her child.” These moments are tender, but stripped of sentimentality, not flinching from the awkward, the unpleasant. This is a book, like Core Samples from the World, that opens a deeper way of seeing and being in the world, inviting us to go back to it again and again. The poet is alive, although “days to come will crack open without you,/dropping their yolk over places you’ve walked.” Judging from this book, Forrest Gander is making what he can of those days and the reader is the grateful observer of this process. 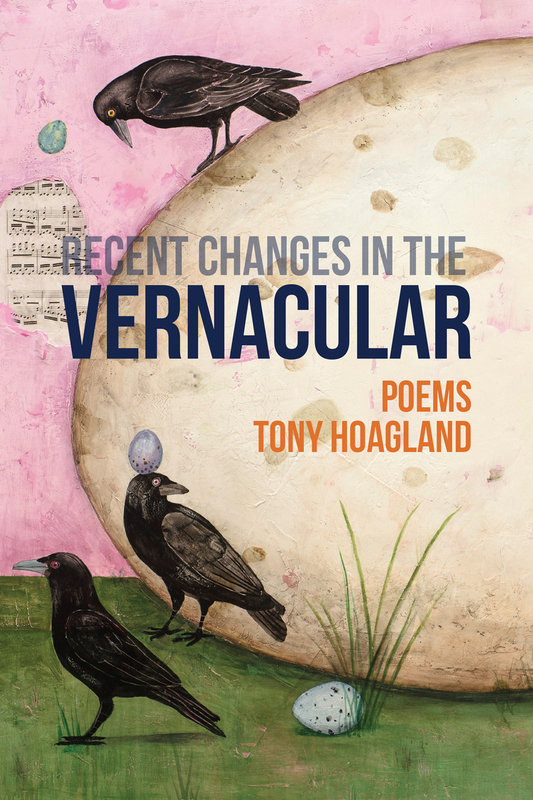 Tony Hoagland’s books probably have the most intriguing titles of any contemporary poet. The newest one, Priest Turned Therapist Treats Fear of God (74 pages; Graywolf Press) follows hard on Recent Changes in the Vernacular, from Tres Chicas Books, out late last year. What Hoagland does better than any other poet is select the exact details to throw the cognitive dissonance inherent in contemporary American life into stark relief. Never sentimental, often fond, and always accurate, his lines cut through to the essence of experience. Yet they are leavened by tenderness and longing, a wry acceptance of the human condition. 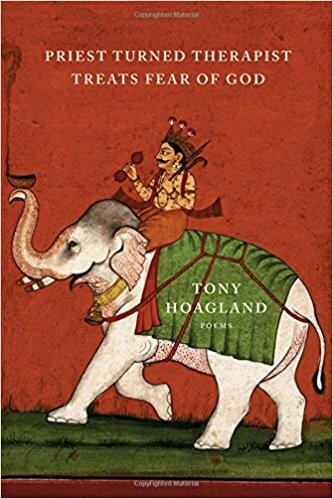 There is an elfin quality that is particular to Hoagland’s work that tempers the sharpness of his vision. And it’s impossible to read a book of his poems without laughing out loud at least once. Humor is his weapon of choice. until world thirst is ended. 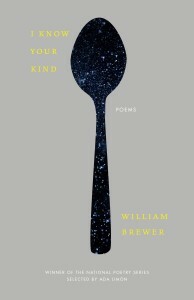 It’s rare that any book of poems, not to mention a first book, is as powerful as I Know Your Kind (96 pages; Milkweed) by William Brewer. This book, rooted in the physical and spiritual landscape of West Virginia, tackles the opioid epidemic in verse. Focusing on the small town of Oceana (nicknamed Oxyana for the record number of overdoses there), Oceana acts as a stand-in for West Virginia as a whole, which has the highest OD rate in the country. The book is at once dreamlike and visceral, and the images in it draw on the beauty and pain of a West Virginia that is, in Brewer’s words “last on every list,” a state that people in the nation’s capital, only a few hours away, barely acknowledge and clearly don’t care much about. Brewer, who has two poems in the Spring/Summer issue of ZYZZYVA (which you can purchase here), is currently a Stegner Fellow at Stanford. 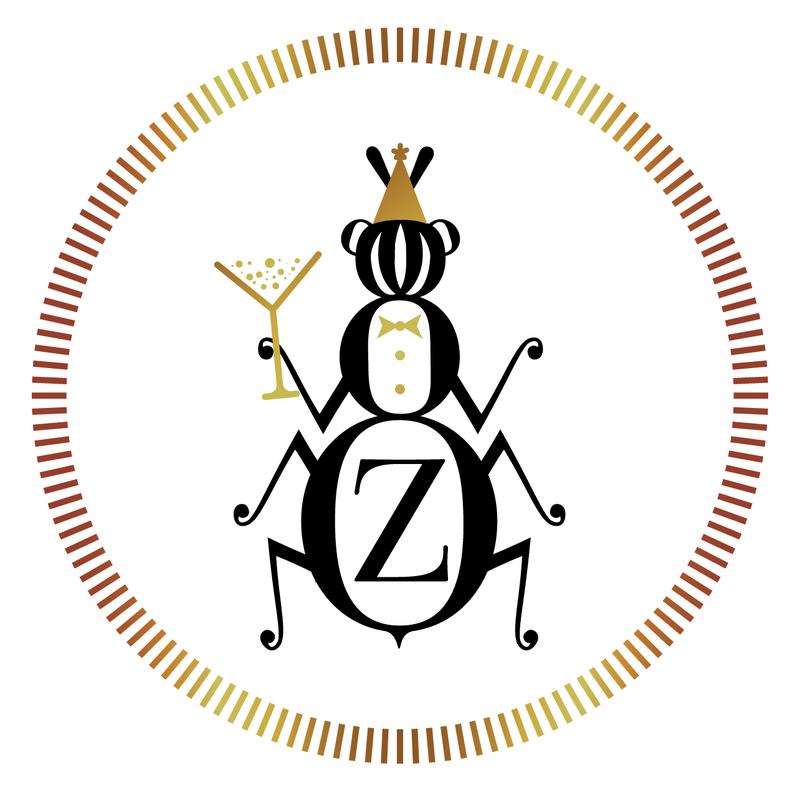 He will be reading with other ZYZZYVA contributors as part of the Spring Issue Celebration at East Bay Booksellers at 7 p.m. on Friday, April 13, and then in a solo reading for the Marin Poetry Center at Mill Valley Library at 7 p.m. on Thursday, May 31. This interview took place at a cafe in Oakland. 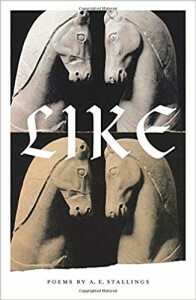 ZYZZYVA: Your book seems deeply rooted in a sense of place, but in order to write about it, you seemed to need to get some distance, to be able to see it clearly. Can you speak to that a bit? William Brewer: I didn’t leave it to write about it, but I realized by leaving just how much it impacted my aesthetic brain. The way I visualize and imagine the world is completely determined by where I grew up. There’s a kind of sheer beauty to West Virginia that makes it a very distinct place, visually speaking, and it also possesses a sense of ancientness. Out here [in California], the Sierras are still growing, but the Appalachian Mountains are incredibly old. That’s where all the coal and minerals and gas come from, those ancient deposits. They exude an intense energy. In West Virginia, the landscape has long been the driving force of its economy. The mountains were a source for prosperity for some, but often those who live there watch its great natural beauty destroyed for the benefit of others. At the same time the mountains themselves can make you feel like you live in a prison. The mountains make it difficult to get anywhere. There are places that are just really inaccessible, and communities have been existing there for a hundred plus years without much input from the outside world. On a larger scale, West Virginia is surrounded by states that are more prosperous and have a lot of political sway and cultural input. Because of that, West Virginia is often seen as a sort of black hole, a place that doesn’t exist, or that at most is a place people have driven through, but not a place to which anyone really goes. Which is a shame, because it’s really a remarkable place. Lots of really intelligent people think it’s a part of Virginia. It’s a place where you are constantly told you don’t matter. Add to that a failed economy, and in some places a deep sense of physical isolation, and you can pretty quickly feel a deep disconnect from the rest of the country. Z: Do you think that fueled the opioid epidemic? WB: I think a couple of things fueled the epidemic. One is that pharmaceutical companies saw an opportunity to abuse people for profit. I’m always going to point to that before I point to people. People are down and out everywhere and they are really down and out in West Virginia. You’re constantly being told that you don’t matter, that no one cares. And that gets illustrated pretty clearly when you see just how okay pharmaceutical companies have been with watching West Virginians die. They made a clear value judgment about West Virginian life. They used bodies for profit. In the past decade, out-of-state drug companies shipped 20.8 million prescription painkillers to two pharmacies four blocks apart in a southern West Virginia town with 2,900 people. They knew what they were doing. Z: I read in an article about small town America that bright children are often encouraged to leave from an early age, to seek opportunity elsewhere. Did you have that experience? WB: No, not really, though brain drain is a real problem in WV. For me personally, I was basically a visual artist up until my senior year in high school, and so the plan had always been for me to go away to art school. At the last minute I decided I wanted to attend a liberal arts college, basically because I fell in love with reading and wanted to do that and only that for four years. But another part of it is that I grew up in Morgantown, which is a college town, home to West Virginia University, so it was far more common for someone from there to stay for college than it was for them to leave. Most of my friends wound up staying. Z: So how did you make that shift from visual art to poetry? WB: The summer after my junior year I went to Brown University for a pre-college summer school. That’s really where I was first introduced to poetry. I was exposed to so much, especially other students who were so much more sophisticated than me—they knew so much about art and literature; it really opened my eyes to a larger world. There was just so much data that I had no awareness of at all. So then I didn’t want to go to art school, because I felt illiterate. I took a creative writing class, and it opened up a new horizon for me. Fast-forward to college where I take a poetry workshop and it immediately clicked because poetry is very visual. I essentially translated my art brain into a poetry brain. And that still holds true today—if I’m writing well, I’m not really thinking so much as feeling like a five-year-old with a crayon. It’s all about trust in my imagination. But my imagination needs to be fed a lot of material and energy. I feel like I need to read about two books of poetry for every one poem I write. Z: Who were your early influences? WB: Mark Strand was the first poet I loved, which made a lot of sense when I later learned he’d studied as a painter before he took up poetry; the visual quality of his work really made sense to me. I was introduced to Jack Gilbert by my first great poetry teacher and mentor, Christopher Bakken, and Gilbert’s work really lit up my brain because here was this poet from Pittsburgh—which was just south of where I went to college and just north of where I grew up, not to mention a place I love—describing landscapes that are very much a part of my DNA, and doing so in a way that imbued them with a great deal of value, without turning them into set pieces. He made them dynamic places that influence how you live your life. I’d never seen that before. Z: That’s one of the things that struck me about your first book, the way landscape is interwoven with action. At the same time there’s a dreamlike quality that compliments the subject. WB: Yes, I want the poems to have that dreamlike quality. I think for me that’s also an expression of reality. The strangeness of what the epidemic has done to places sounds dreamy—or, more specifically, nightmarish—when you put it in words, but it’s reality. The idea of EMTs running between houses or people collapsing on the streets sounds like a terrible dream, but it’s real. Z: How did you come to write about the opioid addiction? WB: I never planned to write about it or about West Virginia. I certainly didn’t want to write about coal miners or timber people or people living down in the holler, or however else people see West Virginia. I mean you can write about Texas without writing about cowboys. As a literary idea of a place we allow people to write about Texas cowboys and about people who have never been on a horse in their life. Basically it just worked its way into my private life. Someone close to me told me they were a heroin addict, and my first reaction was repulsion. I said something like “You’ve just pissed it all away, you should be ashamed of yourself.” Then I realized how wrong I’d been, how this person had come to me at their most vulnerable and I wrote them off in the most completely unsophisticated way. It kind of snapped me awake. I thought, if that’s my reaction, someone who’s educated and thinks of himself as thoughtful and caring, then the average reaction is probably no better. There’s something really wrong about this. I thought about that individual and my friends, my community, and the state as a whole, and I wanted to understand why. I wanted to make something that would be there for people who were suffering. In this little state that no one seems to care about, people are dying, and no one has anything to say about it. It was clear to me that there was a great spiritual hurt that was there before the epidemic began, that was part of being from West Virginia. You are at the bottom of every list—worst schools, most depressed, highest poverty level, everybody’s sick. This notion of being beaten down, of being told you’re nothing and that you have no agency, that was already there. The idea that the epidemic was hillbillies partying just isn’t true. Then I realized that what was going on with the epidemic was a continuation of the West Virginia narrative: Massive entities like timber, coal, and chemical corporations exploited people’s bodies to turn massive profit, with little concern for their health and safety. This is just another round of that narrative, updated for the post-industrial era. Drug companies using bodies to make money. They look at West Virginians as little cash machines with legs. When I realized this new, but ultimately repeated, narrative was happening, something clicked. Z: I remember that Robert Bly said that after World War II, everything was in tatters, and that it was part of his job to try to put it back together again. Is that how you feel? WB: No, not really. I don’t think I could ever make a claim like that. This is a record of one person’s perception of a culture. At its deepest core it’s not a book about West Virginia or even a book about the opioid epidemic. It’s a book for people; people that I know, and that I don’t know. The attention that it’s brought to the epidemic is a gift, something I’m happy to be part of. But I see it as a book for people who experience the pain of addiction, whether that’s personally, or in their family, or in their community. Now, that being said, it is still very much a book about West Virginia and the epidemic. But from the time I started it to now, the epidemic’s reach has grown so far. At this point, I think it’d be fair to say that, were you to walk into a poetry reading, in almost any room in America, and ask everyone who knows someone who has struggled with opioids to please raise their hands, every hand in the room would go up. The book is my way of looking at a deep spiritual cry that seems to be happening. Most of it was just fumbling in the dark, reacting to what was going on around me. These things became clear as I did the work. Z: How have people in your community reacted to the book? When you go back, what do they say about it? WB: I haven’t gone back and read yet, though I will soon—mostly when I’m home I’m just off the radar, seeing family. But I have read in places where the epidemic’s claws are deep and the response has been humbling and incredible and really shows me what poetry can do. Z: In the book you speak in many different voices—as people close to you, in the voice of the addict, in the voice of those watching. How autobiographical is it? WB: Some people have asked how I came to describe the effects of the drugs, and the answer to that is when I was in college, I had a bad accident that tore up my leg, and I was administered opioids, beginning with morphine right when I hurt myself and was in the worst pain I could imagine, and the relief they provided was divine. Then I was on prescription pain-killers for a number of months, through surgery and into months of recovery. Luckily, we really heavily monitored my medication, but it gave me an understanding of the kind of deep, almost celestial relief these drugs provide, and how easy it would be to turn to them out of great spiritual pain. If it were offered, I’d be sold. Anyone would be sold. At the same time, I saw how it changed my community. I couldn’t escape it. So all these voices came to me. Z: So where do you see your writing going from here? WB: Whether my work is always going to engage with a kind of political or social element, I don’t know. My second book does, but in a different way. It explores this kind of spiritual freefall of post-industrial America and how larger systems of connected to post-industrial fallout and war find their way into your life, even when you try to avoid it. 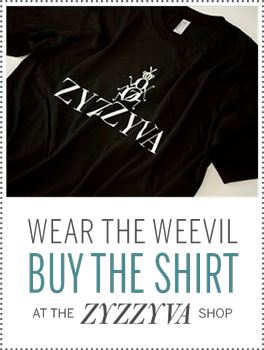 I’m working on long sentences, long lines, and one of the pillar poems from that book is in this issue of ZYZZYVA. In general, I think I’m always working toward that line from White Noise, “I want to immerse myself in American magic and dread.” The magic/mystery element is very real to me. 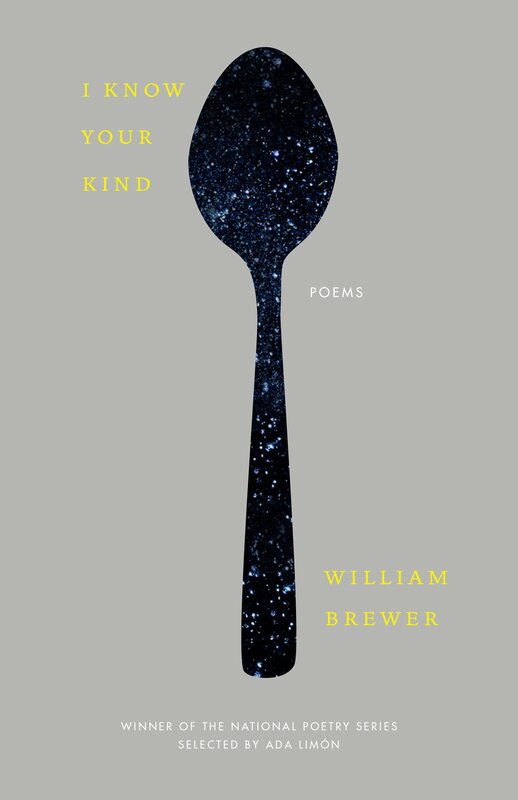 William Brewer is the author of I Know Your Kind (Milkweed Editions, 2017), winner of the National Poetry Series, and Oxyana, selected for the Poetry Society of America’s 30 and Under Chapbook Fellowship. 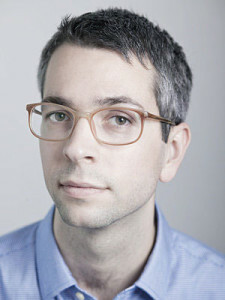 His work has appeared or is forthcoming in Boston Review, The Iowa Review, Narrative (where it was awarded the 30 Below Prize), The Nation, New England Review, The New Yorker, and other journals. Currently a Stegner Fellow at Stanford University, he was born and raised in West Virginia. You can also find his poetry in ZYZZYVA No. 112.
you like your car and wife and life. saving me the trouble of adding salt. His ability to pick just the right detail—the potpie or the eyelids of mice—elevates the poems and gives them power. Of course, not every poem hits its mark; some feel light, jokey, too easy. But as a whole, this book is a complex mix of pleasure and revelation. Who else could write a scene of a man dying of a heart attack in a bus on the way to Atlantic City and end it like this? We are there with the tired trooper, the hopeful gambler, and that perfect detail—the Corgi in her purse. We are with them and of them, rueful observers as death exits down the interstate. As for the personal, “The Age of Iron,” which opens Section II of this book, stands as one of Hoagland’s most masterful poems—one that I wish there were space to quote in its entirety. As it is, you’ll need to read the book. Because I love poetry, I always open a new book with some trepidation. I so much want it to be good, to be transformative, and as I turn to the first page I brace for disappointment. 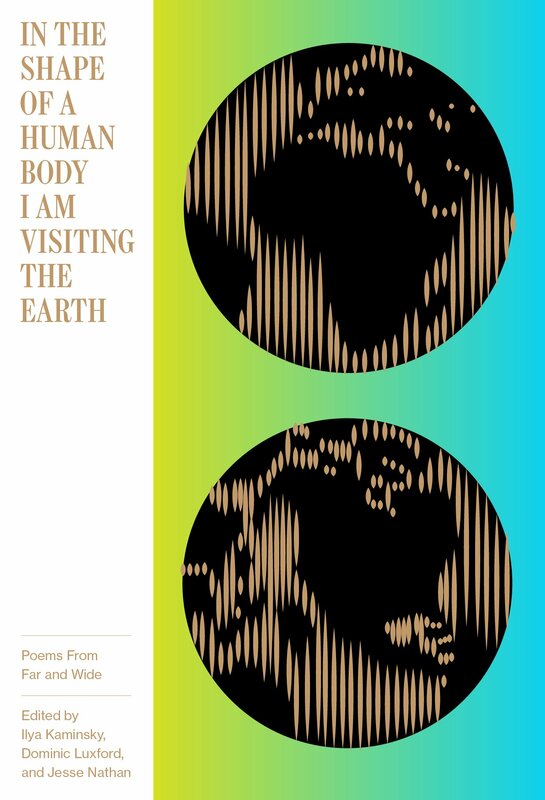 But from its intriguing title to its diminutive footprint In the Shape of a Human Body I Am Visiting the Earth: Poems from Far and Wide (McSweeney’s; 184 pages) sparkles. 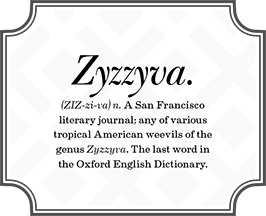 Honed from the archives of Poetry International by a trio of editors (Ilya Kaminski, Dominic Luxford, and Jesse Nathan), the poems span centuries and countries. Poets range from standbys such as Baudelaire, Celan, Neruda, Rilke, Walcott; to acclaimed living poets—Hirshfeld, Ryan, Zagajewski; to contemporary poets from multiple countries whose names and work you may not know. 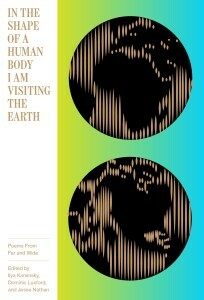 That wonderful series of images left me short of breath, made me think, made me reread the poem from the beginning. I can’t remember when I have read through an anthology with such interest, anticipating the pleasure of each poem, I had to stop again and again to ponder the poem as if staring at the after image of a blaze of light, trying to define its source. It’s hard to define a poem these days. 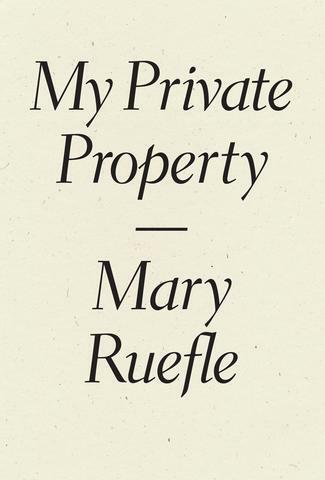 But whether you call the short pieces in Mary Ruefle’s new book, My Private Property (128 pages; Wave Books), poetry or prose poems or essays or flash fiction or mediations or whatever, I’m hooked on them. They “go down a treat” I might say if I were British and lived in the last century. And they are deceptively simple. Simple, that is, until you try to figure out how she does it. How does she create a tone at once distanced and intimate? Straightforward and offbeat? Mary Ruefle’s mind is on display here in all its quirky richness. 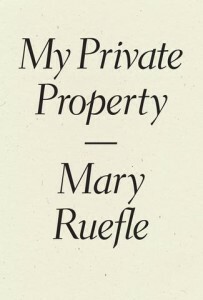 If you don’t know her erasure books, her essays, or her earlier books of more conventionally lineated poetry, starting with My Private Property will give you the essential flavor of her work. Whenever I open a new book of poems, I am torn by twin currents of hope and dread; hope that there may be something fresh, meaningful, transcendental inside, and dread that it will be more pretentious nouveau pointlessness. Is that too strong a characterization? Not if poetry is the cornerstone of your (with a nod to Forrest Gander) faithful existence. Many poetic and philosophic references infuse these poems. Jollimore’s first book, Tom Thomson in Purgatory, which won the 2006 National Book Critics Circle Award, was at least in part an homage to John Berryman. The series of forty-two linked sonnets shows us a sad, slightly comic everyman, an update to Berryman’s Henry. In his second book, At Lake Scugog (an unfortunate title for an excellent book), Jollimore’s Tom romped though part of the book, but Jollimore also played with other forms—pantuom, terza rima, and rhyme, in general.